SnoGLOBE Equality Alliance will present a special screening of Inlaws & Outlaws on Sunday, January 29th at 2 pm to kick off their Winter 2012 Film Festival, Snohomish County's first LGBT film festival. The screening will be presented at Everett PUD Theatre in Everett, Washington. Following a community social that begins at 1 pm, Seattle filmmaker Drew Emery will be on hand to introduce the film and join the audience for a Q&A and discussion after. SnoGLOBE's inaugural program showcases three films that draw attention to the lives and hearts of LGBTQ people. In addition to Inlaws & Outlaws, the Festival includes the locally-produced short 2011 Web Cam Confessions: Voices of GLOBE Youth, as well as the feature Out In America. This event is co-sponsored by: True Stories Project, AIDS Project Snohomish County, GLOBE, Everett Snohomish PFLAG, Two Cats Productions and Sisters Of Perpetual Indulgence. All proceeds benefit SnoGLOBE programs and services. 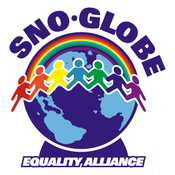 SnoGLOBE Equality Alliance is creating an affirming, equal, just and unified community by promoting safety, acceptance, support and resources for Gay, Lesbian, Bisexual, Transgendered and Questioning youth, adults and allies. We envision a safe, healthy and drug-free community that celebrates diversity and provides a positive environment for GLBTQ individuals.